Traditionally, Sola Fide far outpaces the national average on standardized tests. 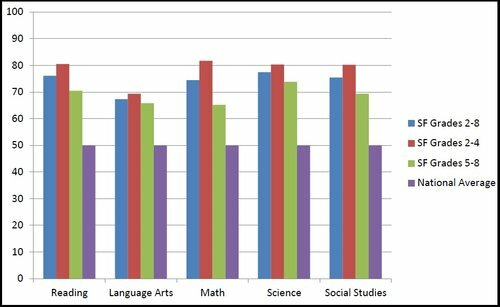 This Graph shows how our students scored on standardized tests in 2012. Equipped with high academic standards, positive parental involvement, and caring Christian teachers, the students at Sola Fide can strive to reach their full potential. Our graduates are successful in high school and beyond. The students at our school take annual standardized tests. Perennially, they do very well. Sola Fide Academy’s formal course of study includes a full and complete curriculum. Our teachers strive to keep our course of instruction consistently Christ-centered and challenging. We offer multi-grade classes that are small, enabling our students to excel academically and socially. It’s an education dedicated to preparing young minds and hearts for the world that awaits. We are dedicated to teaching a child as much as possible during each class. Our classrooms are an open and friendly setting that allows students to contribute. If you are interested in learning details of our daily teaching curriculum, please get in touch with us. We welcome you to set up a time to meet and review the course details with our teachers. We also make sure our students have opportunities to exercise their God-given talents as they study the arts and other ancillary studies.